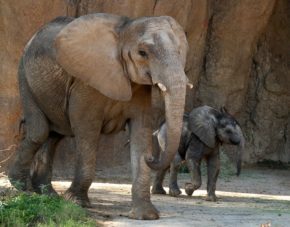 Elephant introductions: A peek at a very complicated process | Dallas ZooHoo! It’s been eight months since we rescued five elephants from Swaziland, Africa, in an intricate airlift to save their lives. Since then, we’ve been introducing the new arrivals – Nolwazi, Amahle, Zola, Tendaji and Mlilo – to our four “Golden Girls,” Jenny, Gypsy, Congo and Kamba. And believe us, entire NASA expeditions to outer space may have been launched with less care, planning, observation and hard work. Have you ever introduced a new pet to your family? Now imagine it with 10,000-pound animals. 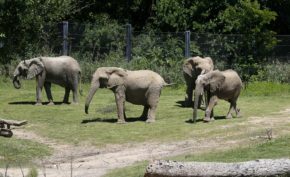 All summer, the nine adult elephants have been in various parts of the Giants of the Savanna habitat, getting to know each other and forming their own complex social bonds. The arrival of calf Ajabu in May brought great joy, but added another layer of complexity to the introductions. Congo, Kamba, Tendaji and Zola graze together in the Giants of the Savanna habitat. Our keepers have monitored the elephants almost around-the-clock. (They even slept in the elephant barn after Ajabu was born, to keep an eye on the little guy.) And our research scientists and volunteers keep detailed notes of all of the interactions, to chart the herd dynamics. It’s been complex, exhilarating, humbling, emotional, sometimes nerve-wracking – and incredibly rewarding. So we’d like to share just a bit of our daily lives with these remarkable creatures, taken from our team’s observation notes and interviews. Remember, training occurs simply so we can provide better medical and husbandry care for the elephants. We utilize “protected contact,” not sharing their space, so we let elephants be elephants. (Note that the italic comments are just a bit of editorial license with our scientists’ detailed observations). 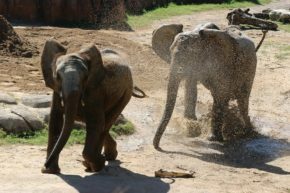 “Golden Girls” Jenny and Gypsy reach over a berm towards Tendaji on his first day in the Tembo habitat. Mlilo and Ajabu in their indoor room, with Amahle in the next stall over. Amahle reached through bollards towards Ajabu, but didn’t touch him. Mlilo was calm. Ajabu now putting more food items in his mouth (like any toddler! ), including hay, alfalfa, grain, leafeater (biscuits). (Non-profit zoo: donations accepted to feed this piglet.) Elephant staff continued to baby-proof lower barn. They also created a rock wall in front of cross logs in Tembo, near Base Camp. Congo, Kamba, Amahle, Zola, and Nolwazi introduction in South Habitat from 8-11 a.m., 9/14. Nolwazi chased Zola twice. Kamba went over to stop the chase, with Congo following shortly after. (Tag, you’re it!) Amahle and Nolwazi ate and walked around the exhibit together. Congo, Kamba, Zola, Amahle and Nolwazi in South Habitat for two hours. 9/15. Amahle stayed near Nolwazi. Nolwazi was below cliff, and touched Congo once from the upper cliff. Amahle displaying a lot of play behaviors. Zola chases Amahle through the mud. Congo, Kamba, Amahle, and Zola in South from 9:30 a.m. until 2 p.m. 9/5. Amahle and Zola wallowed together and sparred. Amahle began roaring for no apparent reason, and Nolwazi vocalized back. Amahle, Zola, Congo, and Kamba in South Habitat. 9/7. Amahle wallowed with Kamba and Zola (nothing like a mud bath to keep a girl beautiful), and sparred with Zola. Amahle remained close to Kamba or Zola for most of intro. Amahle also went swimming. Jenny, Gypsy, Nolwazi in S. Habitat on 9/10. 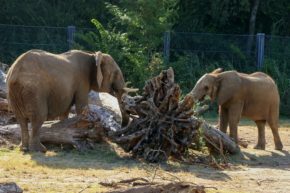 Jenny and Nolwazi observed touching trunks when they were on the same level in South Habitat. (Friends!) Gypsy was close by also. Amahle and Zola observed touching through bollards in the barn. Swaziland elephants working on training: lean in, front and rear foot presentation, trunk wash for TB testing and ear presentation for blood draw. All at different stages of training. Kamba and Amahle share a moment by a root ball. Mlilo and Ajabu given pathway access to lower habitat twice this week. They are going all the way to bottom of stairs. Ajabu stayed close to Mlilo during their first access, but the second time he was more adventurous and went further away from her. Congo, Kamba, Amahle, Zola together in South Habitat. Zola chased Amahle once. Amahle vocalized and Congo/Kamba came over quickly. Amahle approached Zola twice and remained in close proximity with barrier between them. Congo, Kamba, Zola in South Habitat. Zola was playing in the back mud wallow and began vocalizing. Congo and Kamba came over. Zola backed up to Congo, but didn’t leave the area. (Way to hold your ground, Z!) During the keeper chat, Congo chased Zola from Activity Station 1 to Activity Station 2. Tendaji is presenting both ears, allows front foot scrubs. Mlilo and baby calf Ajabu explore the Tembo habitat together. Mlilo and Ajabu in Tembo for the first time. (The little guy’s big debut.) Later that week, both were observed using the mud wallow. Golden Girl meets little one (cue the emotion): Longtime Dallas Zoo resident Gypsy “howdied” with Mlilo and little Ajabu, meeting from different stalls through the bollards in the barn. Mlilo was submissive to Gypsy, and Ajabu stood by the bollards. Gypsy put her head down and approached Ajabu slowly, smelling him, with her ears out. Ajabu touched Gypsy’s tusks with his trunk. Gypsy got down on her knees to let him touch all over her face, then held up her foot so Ajabu could investigate it. Gypsy then put her trunk under the gate to smell Ajabu’s feet. (Like roses, we bet.) Gypsy went back and forth several times to see the little one, from eating at the hay net to the bollards. This is just a sampling of the work our dedicated elephant team does every day to care for these magnificent animals in our care. Our elephant curator, Karen Gibson, and her team are second to none, able to pull off this rescue and integration of herds so seamlessly. Please come meet them at one of our Keeper Talks! Lovely story! Great to hear about how they are getting along. Tears in my eyes from my total happiness for the new Swazi elephants and our Golden Girls. Words cannot express my immense appreciation to the elephant staff for their devotion and excellent care.